Join us for summer fun! A caring environment for children ages three and up. Here, children play, explore and learn with our incredible faculty on our beautiful campus. Our Day Camp expertly blends the enriching experiences St. Anne’s is known for with quintessential summer fun! Discounted price if you register by May 18th. Day Camp is $275 per camper and all campers will receive a t-shirt. Registrations and payment submitted by May 1st qualify for the discounted price of $250 per camper. All registrations and payment are due by May 18, 2019. Registrations submitted after May 18 are subject to a $25 late registration fee. Campers bond with those in their age groups in sessions run by our very own St. Anne’s faculty. All Summer Camp participants will receive a t-shirt. Campers will be given one t-shirt for the duration of summer, so if your camper attends more than one week or program, he or she will get the t-shirt at the first camp he or she attends. By completing the registration and submitting payment, you give St. Anne’s Episcopal School the right to use pictures or likenesses of your camper(s) and all art/literature/science projects created in marketing materials. Names will be omitted to protect privacy. During Day Camp, a lunch break and two snack breaks will be scheduled. Parents should pack a lunch box/bag and snacks to eat during this time. Please note there is no refrigerator or microwave available for lunches. St. Anne’s Episcopal School reserves the right to determine whether a class change or cancellation is necessary based on the number of participants. If a change is necessary, families will be notified, and when possible, offered an alternative session. If no alternative is available or desired, the school will refund the cost of the selected camp. Please be aware that St. Anne’s Episcopal School is a peanut/tree nut aware environment. We call it this, as we understand that despite the best efforts and intentions of all involved, it is not possible to guarantee a completely allergen-free environment. When packing snacks and lunches, please do not include items containing peanuts or tree nuts. We appreciate your cooperation in helping us keep our children safe! cancellations Parents wishing to cancel their camper’s enrollment from a camp may do so until May 18. Cancellations made after the deadline will be subject to a $100 cancellation fee. Please understand that after May 18, we have made firm financial commitments to our faculty and staff, in addition to purchasing materials. registration Registration and payment due by May 18. Registrations submitted after May 18 are subject to a $25 late registration fee. Registration can be completed online or on paper (one form per camper). Please send payment with a Payment Form (one per family) to the school, ATTN: Summer Camp–Stacie Emerson. Checks should be payable to St. Anne’s Episcopal School. Please write “Summer Camp 2019” on the memo line. 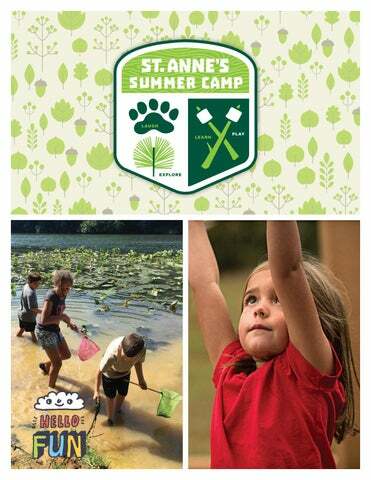 St. Anne's in Middletown, DE is offering a summer camp in June and July this summer. Please look inside for more details.